April has been and will be a busy month, and thus the reason for the slower posting schedule here. I’ve been conducting workshops in Richmond VA and San Antonio TX, with lots of meetings in between. And on top of that, we have started accepting people into our fee-based evangelism mentoring program. Richmond’s workshop was with the Presbytery of the James, called “How Presbyterians Do Evangelism.” I’ll be posting the PDF of the workshop after I email it out to the new subscribers to our newsletter list. Over these past 10 days, I’ve met lots of awesome people, connected with a few new churches, and continued to spread the vision of EvangelismCoach — to ignite the church in the power of the Holy Spirit to passionately fulfill God’s call to reach the nations. 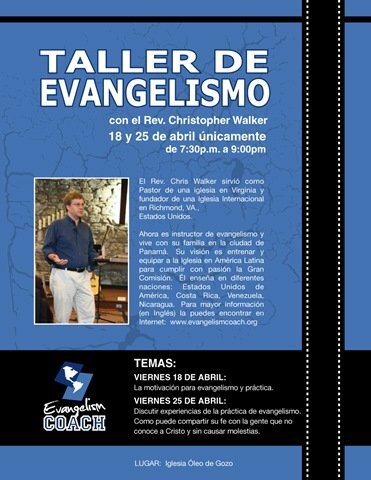 To finish out the month, the next two Friday’s I’ll be conducting evangelism workshops in Spanish at Oleo de Gozo church in Panama City. April 18 — the motives for evangelism and the Phillip and the Ethiopian. This is the basic personal evangelism model that we use. Homework — looking for people that God points out. April 25 — discuss the weeks experiences and coach on how to present the gospel. Praying for you, Chris. It is obvious that the Lord has a hand on the work He’s called you too. Wish my timing for Richmond and yours would mesh.